Hydrilla verticillata is a member of the Hydrocharitaceae family. It closely resembles other members of this family such as Elodea canadensis and Egeria densa. Several members of this family are popular with the aquarium and nursery industry because they are hardy, tolerant plants. Consequently, some have become severe pest problems where introduced to waters outside their native range. Biology & Spread: Commonly reproduces from fragmented stems which readily regrow, forming new clones of the original plant. New shoots also bud from leaf axils (where petioles attach to the stem) as well as from subterranean tubers. Hydrilla can grow up to 1 inch in a day and stems can reach 30 feet in length. Stems grow until they reach the water surface, filling the entire water column. History: Hydrilla was first introduced into North America in the mid to late fifties by the aquarium trade. California officials have also traced hydrilla infestations to shipments of mail order waterlilies. Once introduced and established, hydrilla is easily spread through boating and fishing activities and by waterfowl. Hydrilla tubers are readily consumed and regurgitated tubers have been shown to be viable. U.S. Habitat: Hydrilla is a submersed, freshwater perennial herb, generally rooted on the bottom in depths of greater to 20 feet where water clarity is good. It is found in lakes, rivers, reservoirs, ponds, and ditches. It tends to form monospecific stands that can cover hundreds of acres. Distribution: Hydrilla is native to parts of Asia, Africa, and Australia. 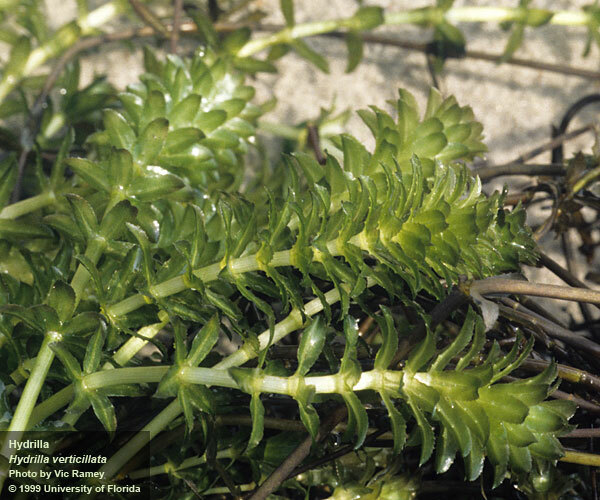 A female dioecious plant was introduced into Florida in the mid-to-late 1950s and dioecious hydrilla has since spread throughout the southeastern states including Georgia, Alabama, Virginia, and South Carolina. Hydrilla is found as far west as Texas and California. Monoecious hydrilla is found in lakes in North Carolina and the Potomac River near Washington D.C. and also has been reported in Maryland and Delaware. 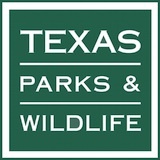 Other Texas alternatives include White water lily (Nymphaea odorata), Delta arrowhead (Sagittaria platyphylla), Floating bladderwort (Utricularia radiata). Scientific research and 30 years of practical experience by aquatic plant managers using herbicides, biological agents, mechanical removal, and physical habitat manipulation have produced relatively successful management programs in Florida and other states. However, in spite of long-term intensive management efforts, hydrilla is still a major weed problem in the states where it has become well established.